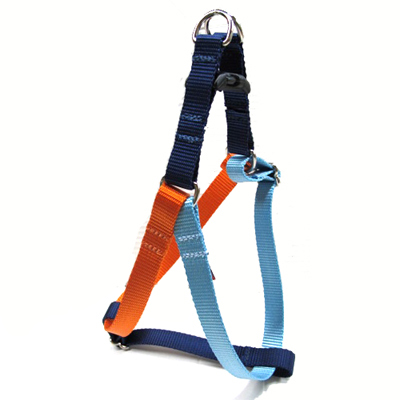 Our Color block web harness is available in 3/4in and 1in widths. Matching lead is available in 4ft, 5ft and 6ft lengths. Our harness and lead features. • Made and shipped from our studio, located on Martha's Vineyard. • Durable quick release contoured snap buckle. • Durable nylon or eco-friendly webbing available. • Machine wash line dry. • Collars are easily adjustable. • Nickel plated steel welded d-rings. • For leash hardware we use premium trigger snaps.